The church is all decorated for VBS! It starts Monday, but we needed to get it done over this weekend because we want the atmosphere created to intentionally build buzz this Sunday. It's cool to see a big canopy in the lobby and a tent on the stage. 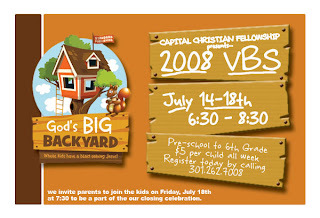 Looking forward to a great week next week at "God's Big Back Yard!" Be sure to get your kids registered and tell others about it too. Thanks to Pastor Mike and the youth, we got almost all the flyers out!